When dealing with architectural heritage from any age, it is essential to highlight its historical background in order to understand the object that you are observing. No architectural project or urban planning theory stands isolated. Instead, they are all a result of the circumstances of their time: trends in architecture and urban planning are joined by political circumstances and social visions that were formulated at the time. I was reminded of this fact during a visit to one of Berlin’s cultural heritage sites, the “White City”. 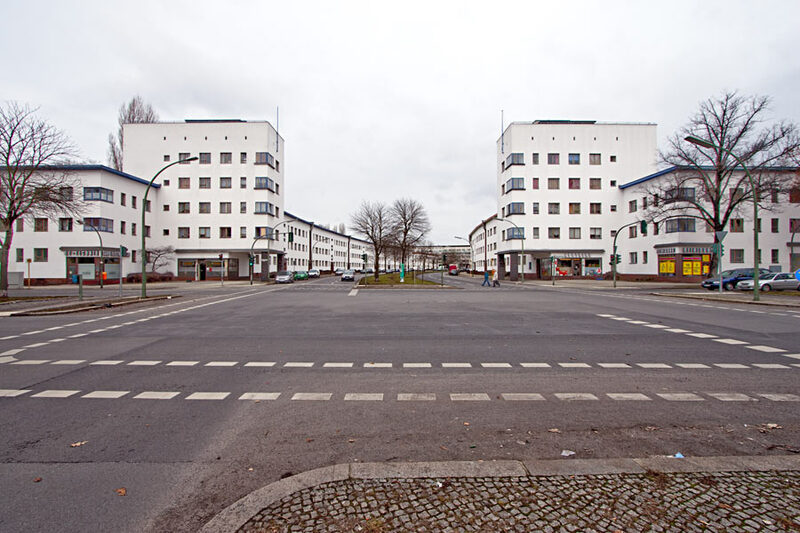 When I was in Berlin in February, I visited the White City (“Die weiße Stadt”) in Berlin-Reinickendorf, a housing complex built between 1929-1931. 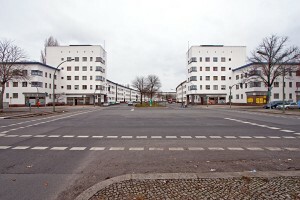 The White City is one of six large scale housing projects built between World War I and World War II that have been enlisted on the UNESCO World Heritage List in 2008: Gartenstadt Falkenberg (“Garden City Falkenberg”), Siedlung Schillerpark (“Schillerpark Housing Complex”), Hufeisensiedlung (“Horseshoe estate”), Wohnstadt Carl Legien (“Housing City Carl Legien”), Großsiedlung Siemensstadt (“Large Housing Complex Siemensstadt”) and Die Weiße Stadt (“The White City”). All of these housing projects are answers to a severe problem in Berlin after World War I: the shortage of housing space. At the same time, urban planners were proclaiming a new vision of urban living: in reaction to the prevalent type of housing of the time — tenements where a great number of working class people lived in cramped spaces, often without sufficient access to daylight and under insanitary conditions — they formulated urban planning paradigms that aimed to offer space and air to everybody. The city administration provided funding and passed laws that allowed (and even enforced) the construction of large scale housing projects that were based on these new planning principles. In this manner, a massive amount of over 140.000 housing units was built in the years between 1919 and 1930. The aforementioned housing complexes that were recently enlisted by the UNESCO are key projects in early modernist urban planning and architecture. They provided a blueprint after which countless similar housing projects in Germany and Europe were modeled. When I visited the White City though, I didn’t know most of the historical information that I explained above, and the housing complex didn’t really impress me. At first, I was about to blame it on the bleak winter weather, but then I realized that I probably lacked important information which prevented me from pinpointing the underlying logic and core features of the complex. Without a proper background, my impression of the White City remained undefined and superficial. Back home, I did a search for books on the topic and ended up with “Siedlungen der Berliner Moderne” by Markus Jager, Jörg Haspel and Annemarie Jaeggi (eds.). After an introduction which explains the historical background and the urban planning theories that were prevalent at the time, the book presents each of the aforementioned six housing complexes in detail. The White City is built around a central north-south axis, Aroser Allee (see map). The south entrance is marked by two tall “Gate Houses” (Torhäuser) designed by Bruno Arends, which step out of the row of facades along the street and reach out above the pavement. A few hundred meters north, the center of the complex is represented by the Bridge House (“Brückenhaus”) by Otto Rudolf Salvisberg, which crosses Aroser Allee and features loggias one one side and open corridors with the apartment entrances on the other – in it’s function as the center of the complex, it had to have two “front sides” and no backside. The Bridge House also serves as the point that divides the different parts of the complex, all of which were designed by individual architects: the buildings south of the Bridge House, including the Gate Houses, were designed by Arends. The Bridge House itself and the buildings north of it were designed by Salvisberg and the radially arranged rows of buildings to the east of the Bridge House were created by Wilhelm Büning. Inbetween all buildings there are green spaces with parks and gardens – providing this kind of common space this is one of the central aspects of these theories of housing development. Of course, time always leaves its mark on buildings, but I was surprised about the slightly neglected appreance of the complex. Only the facades along Aroser Allee were painted bright white. In the backyards and side streets, the buildings were grey. A lot of the elements like doors and windows are obvisouly still in their original state with little modernization done over the years and therefore look a bit shabby. This state of lacking preservation may be another reason why I wasn’t entirely impressed by the White City. However, had I known more about the background and history of the complex and the theories behind the housing developments of the inter-war years, I would have appreciated the complex in a completely different way. And thus, this is the lesson that I took with me after leaving Berlin: in order to value and appreciate the architecture of the past, you have to be informed about its history and the social circumstances that lead to its creation. There’s a lot to learn from historical architecture, but it takes more effort than simply looking at buildings.